That is so cool! The children will be busy all week and we will have our quit time together. Yayoi Kusama does dots. That's her thing and she's been doing it for a really long time. But if you can get past the branding scheme and the spectacle, it's a pretty sneaky piece — at first glance, a creative free-for-all, but the parameters are so tight (only stickers, all circles, limited sizes and colors) that if the project were repeated, it would probably look almost identical. Maybe that's where the interest lies. 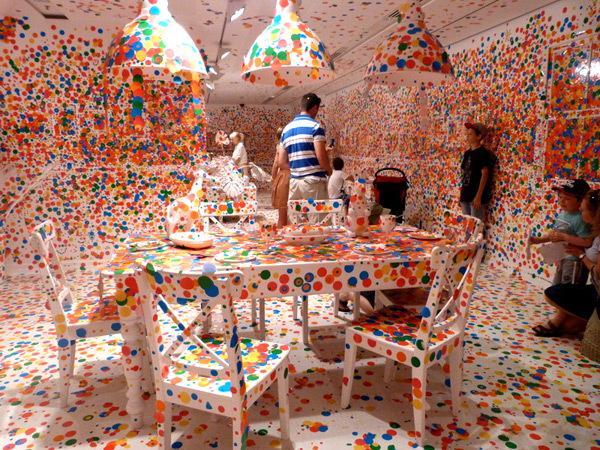 It also changed my first impression to read that the piece was titled "Obliteration Room." It looks like someone Skittles vomited all over everything in that room.